Today I woke up to discover one of the nicest surprises possible: my Sapphire Passiflora was set to open a bloom today! It unfurled slowly through the morning. This variety is an old friend, I hesitate to use the word, “favorite” but it crosses the mind. 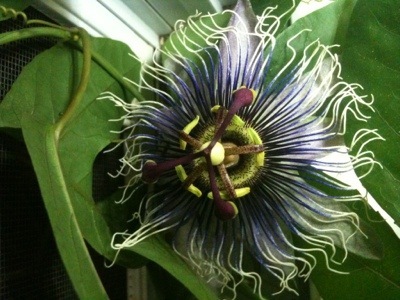 In our Lake George indoor gardens, there are 11 different varieties of Passionflowers. It’s almost an obsession. “Sapphire” has been dormant from blooming for about 4 years until today, so the bloom was a long hoped for sign of life. 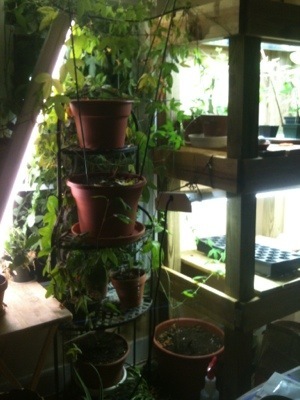 In early spring, everything was repotted and rearranged to optimize the lighting situation. Container gardening is a unique art, separate in many ways from outdoor gardens. 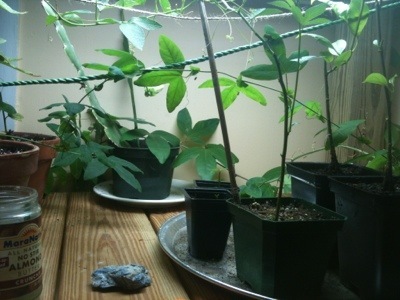 (Many container gardens are outdoors, most notably roof top gardens.) Practicing keeping blooming houseplants invites beauty and life motion to the interior of the home year round.